We at Gearbuggy are always on the lookout for new products that will help make your shooting activities more enjoyable. We were asked to look into a Bench Mounted Kit for the Super Spotter Scope Stand. This is the third effort at that request. I think that it is a good one. This rendition uses the top Mast and the Head Assembly from your Super Spotter Scope Stand. 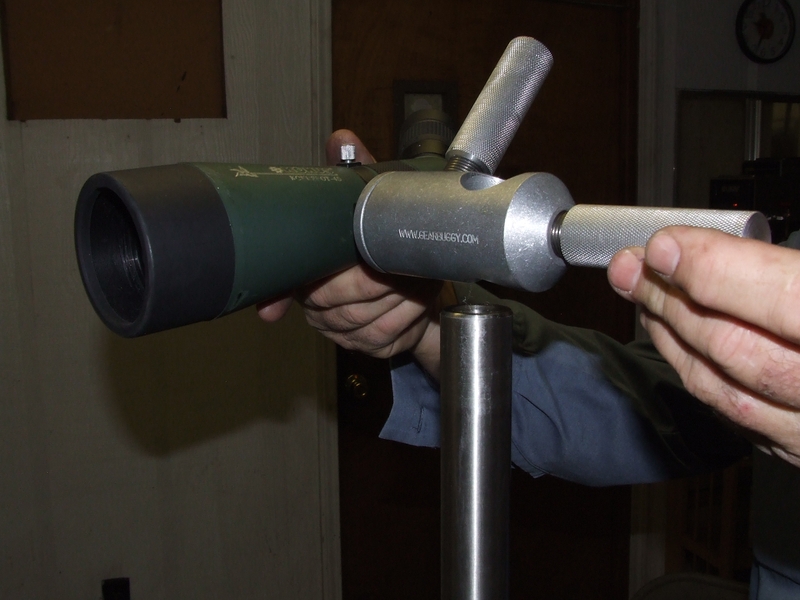 With just a few simple steps you can have your spotting scope attached to the edge of any shooting bench. It will accommodate almost any thickness bench top and leaves no marks or scars on the bench top. It can also be attached to a vertical beam or post. Here we show the Bench Mount Adapter Kit as it comes to the shooter. The Lower Clamp Plate, on the left, screws onto the threaded stud on one end of the Mast. The Upper Clamp Plate Assembly Slips onto the Mast above the Lower Clamp Plate, with the Swivel Pads facing down. There are 2 Wing Headed Thumb Screws on the other side of the Swivel Pads. 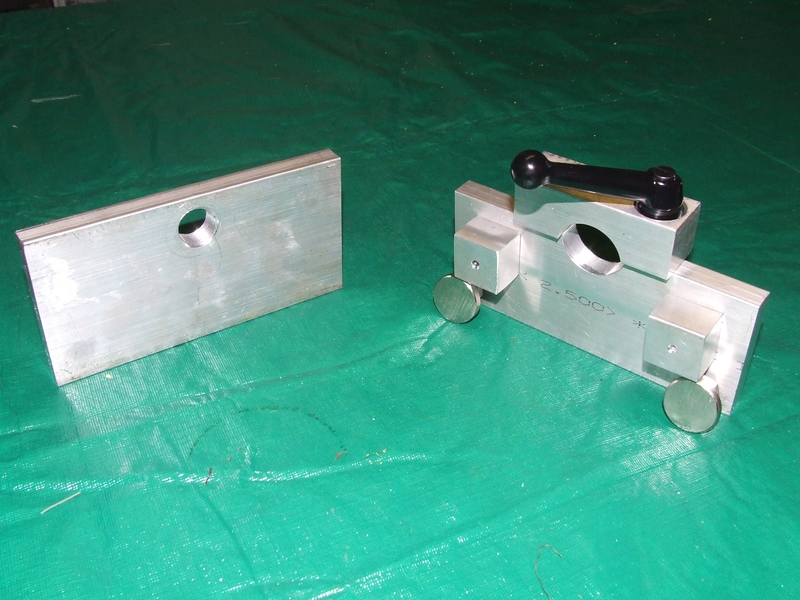 Here we show the Lower Clamp Plate and the Upper Clamp Plate Assembly on the Mast. Back the Thumb Screws all of the way out to allow the Spacer Pads to touch the bench top. Place the unit at the edge of the bench top with the Mast touching the edge of the top. Hold the Lower Clamp Plate firmly against the bottom of the bench top and press the Upper Clamp Assembly against the top surface as shown. Try to eliminate all play between the Upper and Lower Clamps and the bench top before you snug the Handle to the clamp the Mast. 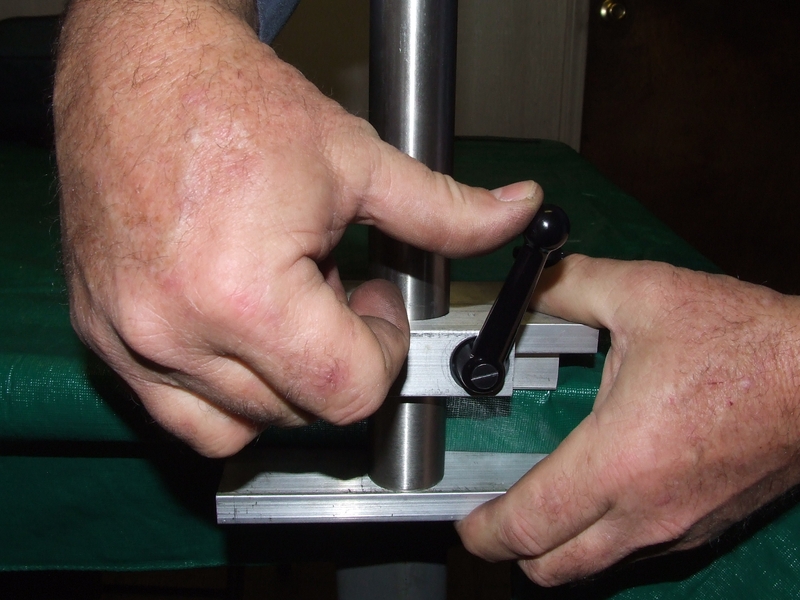 Lightly snug the Indexable Handle to clamp the Mast. Lightly snug the 2 Thumb Screws to tighten the Swiveling Leveling Pads against the bench top. A little bit of torque goes a long way. 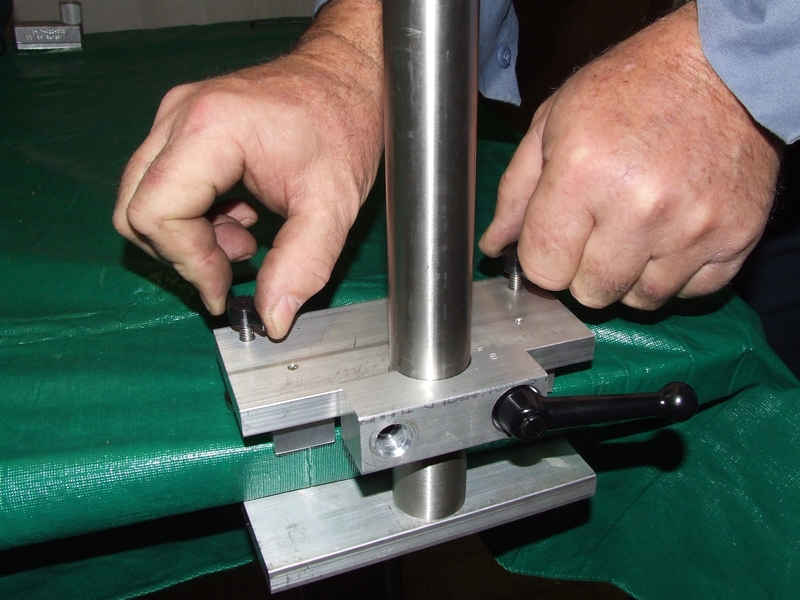 Next, slip the Head Assembly with your scope over the top of the Mast and place it at the desired height. 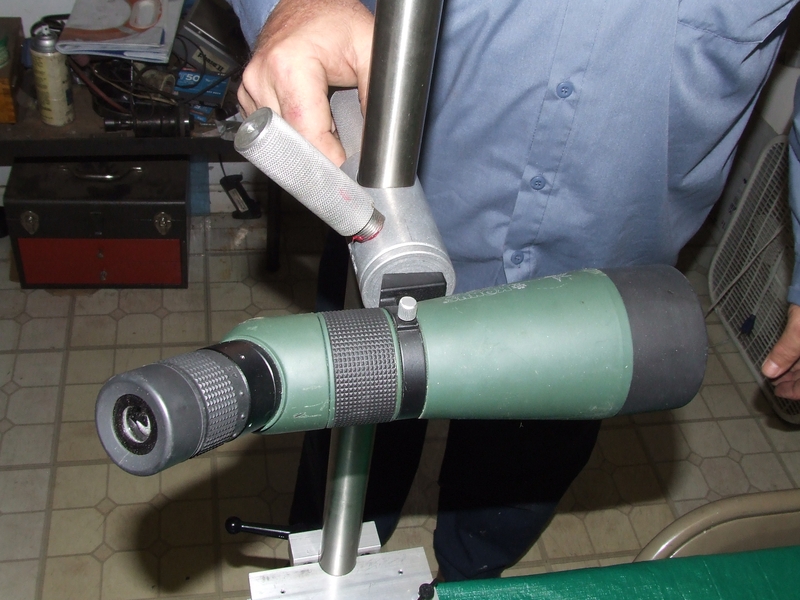 A right hand Head Assembly is shown here with a small Konus scope. It handles this size scope as well as the much larger Konus 100mm scopes. 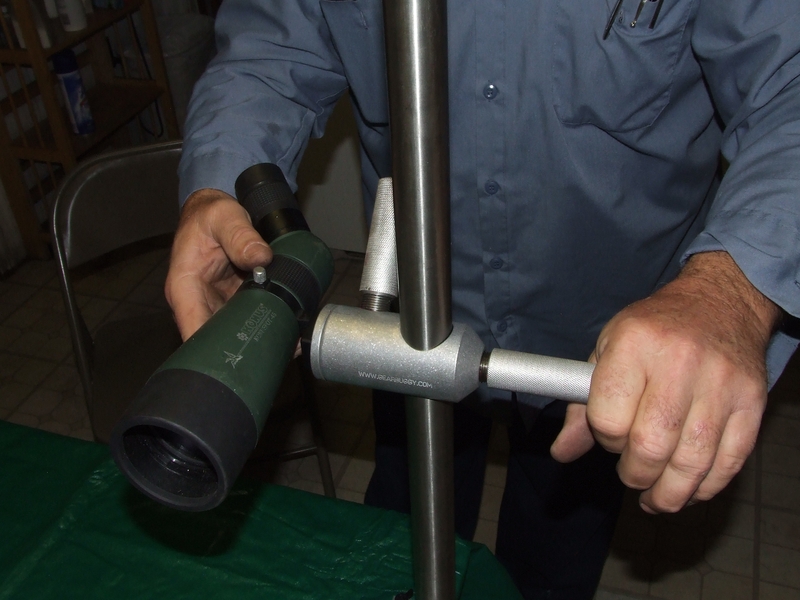 Lightly snug the Horizontal Handle on the scope Head Assembly to secure the vertical location of the Head Assembly. This will allow the shooter to adjust the horizontal aiming of the scope by pushing or pulling the Horizontal Handle to acquire his target. When you are on target, snug the Handles again and you are set. 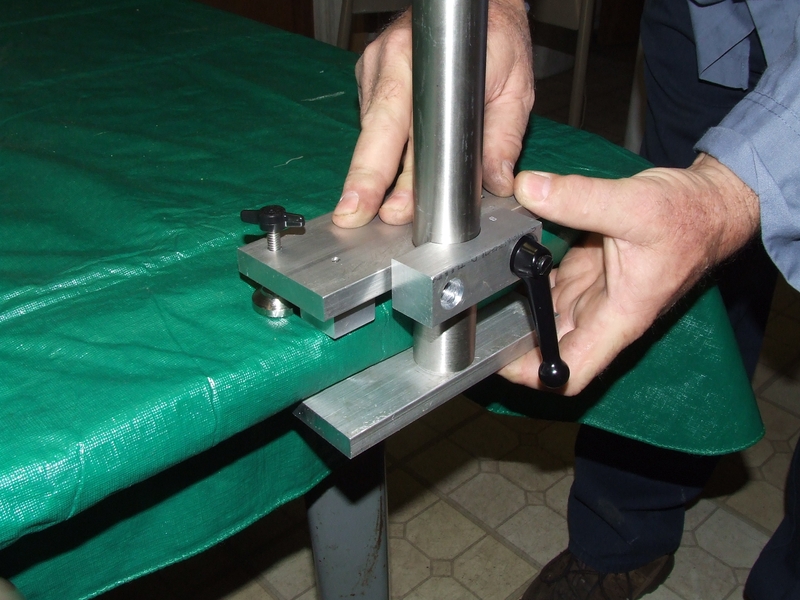 This frame shows the Bench Mount Kit attached to the left edge of a table. In this case, your shooting position would be to the right of the scope. Lean to the left to view the target. 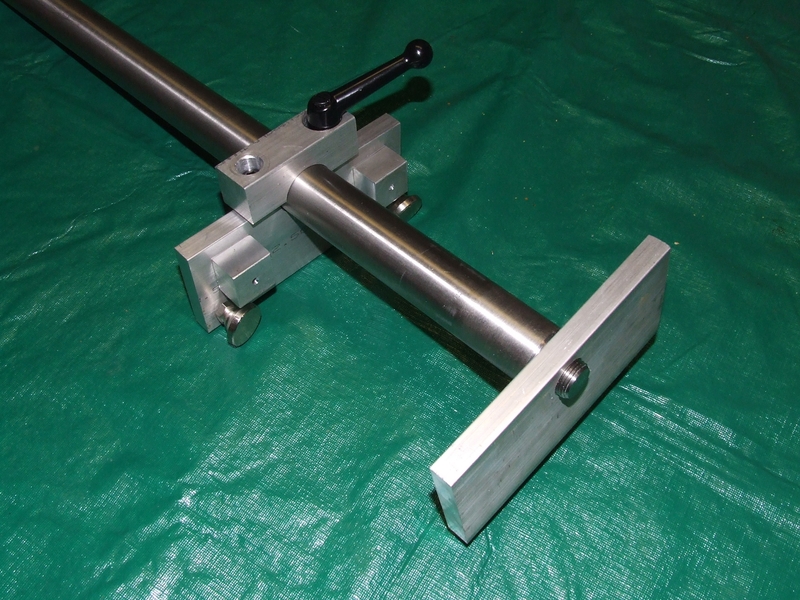 The Bench Mount Kit is in the production at this time. I have the price at $115 for the Base Kit, complete and ready to use with your existing Super Spotter Scope Stand Mast and Head Assembly. If you are interested in having one of your own, I can get you one out in short order. I can also supply a complete Bench Mount Unit that includes all of the parts for the Bench Mounted Stand for those shooters that do not have the Super Spotter Scope Stand basic unit. This would include one Mast Section, the Base Bench Mount Kit, a Top Ball Knob, and a Head Assembly for those of you that do not already have the Super Spotter Scope Stand. This unit is complete with all items necessary to take directly to the range. Of course, you still have to supply the spotting scope. Pricing for this unit is $298, plus applicable taxes and shipping. On sale now for $250, complete and ready to use. Contact me and let me know what length Mast you want. If you have any further questions, comments, or concerns, please contact me. I thank you all for your support, and for your comments and suggestions. Good luck, and good shooting.